Mary Ellen's Cooking Creations: Stuffed Peppers...for Breakfast! Eggs are a quick and easy way to have a filling breakfast, so I love making them. I'm always looking for new ideas, so when I came across a recipe for stuffed peppers in this book, I decided to give it a try. I love how pretty these peppers are! What a great idea for a brunch or serving overnight guests. 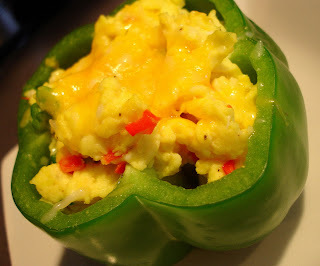 Once eggs are done, fill each pepper cup with the eggs. Top with cheese and put under the broiler for 1 minute. Serve immediately. I can't wait to make these again. You could make any kind of scrambled eggs you like, using any number of ingredients - veggies, meats, different cheeses, etc. I was just wondering the other day if anyone had made their stuffed peppers with eggs. Wonderful idea! Glad to see that it works well. Wow, what a great idea! It looks amazing, I am going have to try these. 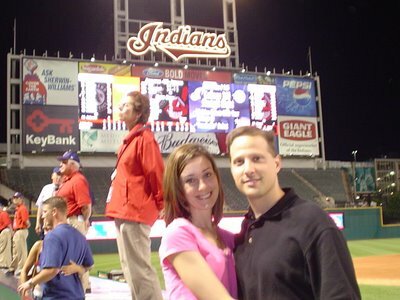 Happy Valentine's Day Mary Ellen!!! I love this recipe and think I am going to make it for Easter weekend for my husband!